The coalition of groups going to Washington, DC, Oct 2-4 to lobby GOP lawmakers, DOJ, and the White House to take swift and decisive action to curtail Democrat dominated Silicon Valley corporation cyber censorship of conservatives is compiling a list of victims to share with the media and the American public. ALIPAC and Oath Keepers have both been targeted by companies like PayPal, Twitter, Facebook, and Google, and in response are now organizing a first of its kind lobbying effort in Washington to oppose Silicon Valley censorship. Oath Keepers and ALIPAC believe these companies are using their vast power, wealth, and surveilance state technologies, to provide unequal services to Americans, discriminate against Americans based on creed, and attempt to take control of US elections, laws, and policies. Groups, pundits, activists, and average citizens who feel they have been treated unfairly and unequally by Silicon Valley companies are encouraged to take the following steps. Step 2: Send hard copies of these bias reports to the media and GOP lawmakers in DC along with the US Department of Justice, the White House, and your state's Attorney General. 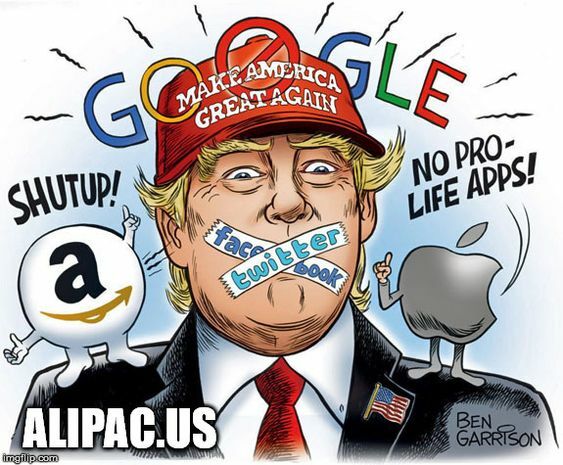 Step 3: Notify ALIPAC.us of your bias complaints for inclusion in the List of Conservatives Censored by Silicon Valley companies Facebook, Google, Twitter, & PayPal. The list of victims of Silicon Valley totalitarian abuses will be updated daily in the run-up to the October 2-4 lobbying effort. A copy of the list will be provided to government regulatory agencies and GOP lawmakers. Groups and activists who wish to join the coalition should contact William Gheen of ALIPAC or Stewart Rhodes of Oath Keepers. Wes Cook band's song "I Stand For The Flag"
Last edited by ALIPAC; 09-20-2018 at 10:04 PM.